The Easter bunny, brightly colored Easter eggs, and Easter baskets filled with treats—all of these popular traditions are a part of Easter. Easter is a joyous holiday for Christians. It celebrates the resurrection, or rebirth, of Jesus Christ. Easter is always celebrated on a Sunday, the day of Christ’s resurrection. But the exact date of the holiday changes from year to year. Easter falls sometime between March 22 and April 25. The Friday before Easter, called Good Friday, marks the day that Jesus was crucified (nailed to a cross). Crucifixion was a common death penalty in the ancient Roman world. Christians believe Jesus was sacrificed to pay for the sins of humankind. They can cut metal. They can cut glass. They are billions of years old and form deep within Earth. Some are so rare and beautiful that people will pay a fortune to get one! They are diamonds. Diamonds are made of carbon, a chemical element. That’s the same stuff that’s in the tip of a pencil. But isn’t carbon soft, not hard? Pencil carbon is so soft that it rubs off on paper. But diamond carbon is so hard it can cut almost anything. In fact, diamonds are the hardest things in nature. What makes the difference? 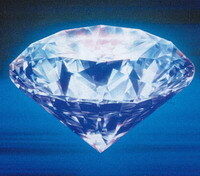 The atoms inside a diamond have a special crystal shape. This makes them very hard. Valentine’s Day is celebrated on February 14. People exchange valentines—greeting cards or gifts of candy and flowers—with friends and people they love on this day. Valentines express love and affection. Valentine’s Day also is the same day marked for lottery lovers. It dates back to Roman times when young boys and girls had to lead strict separate lives. But on this day on the eve of the festival of Lupercal the names of young girls were written and placed in jars. People send each other cards and give gifts to their families and friends. In homes and in stores, evergreen trees glitter with colorful lights and ornaments. Children look forward to seeing a jolly, white-bearded man in a red suit named Santa Claus. It all can mean just one thing: It’s the season of Christmas, a holiday celebrated every year on December 25. Christmas is a Christian holiday. It commemorates the birth of Jesus Christ more than 2,000 years ago. Red Square and Kremlin, Moscow landmarks that have played a central part in the political life of the city and of the former Union of Soviet Socialist Republics (USSR). The Kremlin, a triangular fortified enclosure in the center of Moscow, is now the seat of the Russian government and the center of the Russian Orthodox Church. 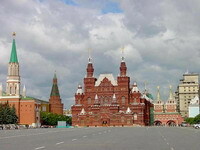 Red Square is located at the foot of the Kremlin's eastern walls. The Kremlin (Russian, Kreml') was founded in the 12th century as a fortress within the city.